Kim Jong Un, chairman of the Workers' Party of Korea (WPK) and chairman of the State Affairs Commission (SAC) of the Democratic People's Republic of Korea (DPRK), visited the People's Republic of China (PRC) from January 7 to 10, Juche 108 (2019) at the invitation of Xi Jinping, general secretary of the Central Committee of the Communist Party of China (CPC) and president of the PRC. Among his entourage were Ri Su Yong, Kim Yong Chol, Pak Thae Song, members of the Political Bureau and vice-chairmen of the C.C., WPK, Ri Yong Ho, member of the Political Bureau of the C.C., WPK and minister of Foreign Affairs, and No Kwang Chol, alternate member of the Political Bureau of the C.C., WPK and minister of the People's Armed Forces, Kim Yo Jong, alternate member of the Political Bureau and first vice department director of the C.C., WPK, Ri Il Hwan and Choe Tong Myong, department directors of the C.C., WPK, and other leading officials of the C.C., WPK and the SAC of the DPRK. Saying that attaching great importance and significance to Kim Jong Un's current visit to China at the special and vital time, Xi Jinping and the party and government of China made exceptional instructions to render good reception, Song Tao added that he would do his best for the satisfactory success of the meeting between the top leaders of the two parties and the two countries. A ceremony for welcoming Kim Jong Un's visit to China was held grandly at the Great Hall of the People. The welcome ceremony was followed by talks between Kim Jong Un and Xi Jinping at the Great Hall of the People. 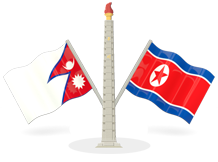 Saying that his current visit would play a very important role in putting the DPRK-China friendship on a firmer stage and promoting it to more developed relations also this year of weighty significance marking the 70th anniversary of the establishment of diplomatic relations in the wake of last year which was recorded as a year that opened a brilliant page in the history of the DPRK-China friendship and unity, Kim Jong Un said that his visit would also offer an occasion in strikingly demonstrating to the world the invariability and invincibility of the DPRK-China friendship. 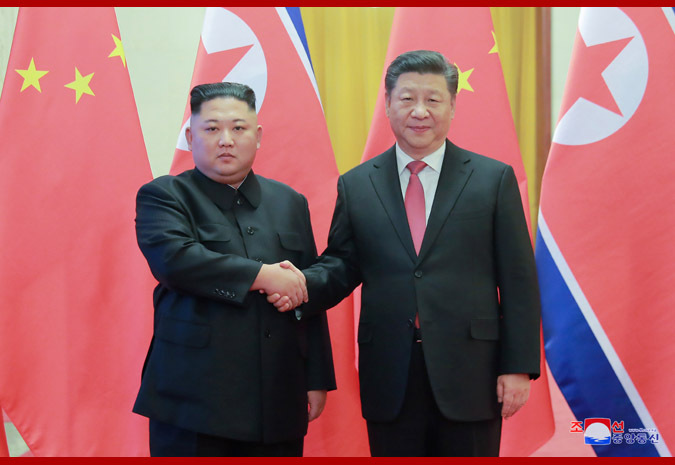 Xi Jinping once again warmly welcomed Kim Jong Un's China visit on behalf of the Chinese party, government and people, saying that the visit at the outset of New Year 2019 is of very special and important significance in terms of time and shows importance attached to China-DPRK friendship and deep confidence in the Chinese party and people. This proves that Kim Jong Un's strategic decision was correct and it was in line with the Korean people's interests and the trend of the times, Xi Jinping said, highly praising the Workers' Party of Korea and government of the DPRK for registering admirable successes at home and abroad. He said that, as a comrade and friend, he is convinced that the WPK would achieve greater and fresh successes in accomplishing the socialist cause under the leadership of WPK led by Kim Jong Un, and expressed his best wishes with sincerity. Present there at invitation were Ri Su Yong, Kim Yong Chol, Pak Thae Song, members of the Political Bureau and vice-chairmen of the WPK Central Committee, Ri Yong Ho, member of the Political Bureau of the WPK Central Committee and minister of Foreign Affairs, No Kwang Chol, alternate member of the Political Bureau of the WPK Central Committee and minister of the People's Armed Forces, Kim Yo Jong, alternate member of the Political Bureau of the WPK Central Committee and first vice department director of the WPK Central Committee, Ri Il Hwan and Choe Tong Myong, department directors of the WPK Central Committee, and other leading officials and retinue accompanying Kim Jong Un. He said Kim Jong Un's three China visits within 100 days last year and his visit to China at the beginning of the new year fully showed that he values much the traditional China-DPRK friendship and cherishes friendly feeling toward the Chinese people. Xi Jinping stressed that he would make efforts together with Kim Jong Un to write a new history of visits between China and the DPRK. He expressed his profound thanks for the warm hospitality and deep attention of the party and government of China on his visit made at the beginning of the new year and extended heartfelt New Year greetings to Xi Jinping, all the members of the Communist Party of China and the Chinese people on behalf of the members of the Workers' Party of Korea and the Korean people. He sincerely wished the fraternal Chinese people endless success in the long journey for attaining the "Two Century Goals" and realizing the dream of China, i.e. great prosperity of the Chinese nation, united close around the CPC with Xi Jinping as the core this year marking the 70th anniversary of the birth of new China.